eBay is the world's online marketplace. Buy and sell electronics, clothing, computers, electronics, digital cameras and much more. Find great deals and the best prices at eBay. Valid eBay orders will post after 30 days. Any cash back transaction that is not reported by eBay's internal affiliate system cannot be opened as a missing cash back rebate claim. A maximum of $50 Cash Back may be earned on any single purchase. Cash Back is awarded for the action of a Winning Bid or Buy It Now transaction by clicking through to eBay from Extrabux and payment for that item. 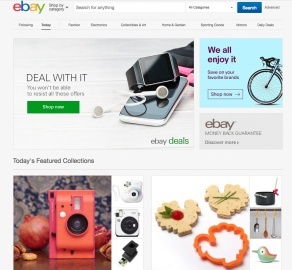 Cash Back will not be earned on unpaid items with eBay. Purchases of duplicate Item Numbers per 60 minute period will result in only one cash back rebate per Item ID. I.E. Purchasing Item Number, 123, in three separate orders in the same 60 minute span will result in only one rebate credited by eBay.Certain categories of goods earn cash back less than 1% as merchants feedback. - Auctions that do not generate a seller fee for any reason. Click a Coupon or click Start Shopping to earn 1% Cash Back at eBay.